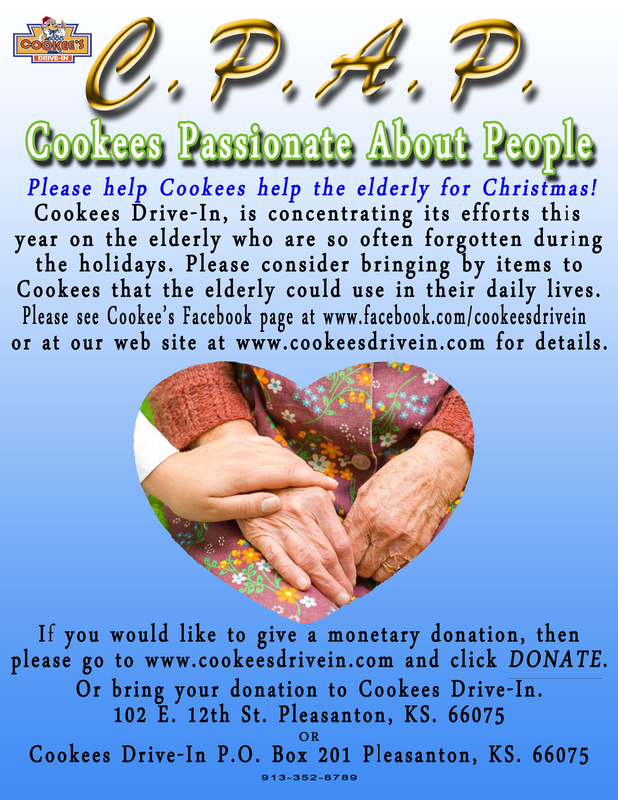 Cookees Passionate About People C.P.A.P. 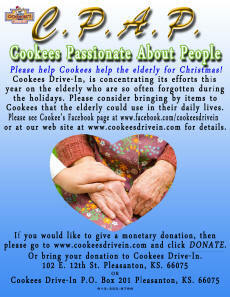 Cookees Drive-In will concentrate its holiday donations this year, to the often forgotten elderly, at Christmas. You too can donate monetary funds by clicking on the DONATE button. Please review the information below to see if you can possibly supply some of these items for the elderly. Please Donate To Help The Elderly At Christmas! The major complaint of most residents is BOREDOM. There is often a fierce competition between elderly women around the holidays! To relieve boredom, patients love books, movies, music, crafts, and visitors. The problem is that most residents find it difficult to read and operate technologically advanced devices. While you might think a portable DVD player with movies is the best gift ever, it might end up sitting on a shelf unused. If you are lucky enough to have a loved one in a facility with a lot of caregivers and volunteers, an electronic device is possible. It’s important to discuss this with caregivers before you invest in the purchase. Be blunt, and ask what the odds are of someone being around to help your loved one operate the device. Craft gifts are a good idea, but you really have to be careful about the types of crafts. Avoid anything with long directions in small print. Crafts allow the elderly to pass the time, but even more important, interact socially with others as they show off their accomplishments. A great craft idea is a large scrapbook kit, to allow them a spot for family photos, and a glue stick. It’s something creative that Grandma will enjoy without straining her eyes or hurting her hands. Men generally prefer more practical gifts like fur-lined walking slippers, a new robe, or large print books if they are still able to read. They also like sweets to munch on from time to time. For all of the residents who are able to leave their rooms and move throughout the nursing home, the day after Christmas is “show off day,” where the residents show each other the cool gifts they got for Christmas. Keeping this in mind, choose gifts that can be worn or shown off throughout the nursing home or assisted living facility. For women, this means colorful, fuzzy or silk scarves or beautifully embellished sweatshirts with lots of color and shine. Residents appreciate a comfy pillow for their wheelchair or a warm blanket also, as these get worn out after time. A “show and tell gift” gives them something new to talk about with their friends, caregivers, and volunteers. It’s a way of making the special occasion of Christmas last longer for them. Giving residents bright, new nail polish color on Christmas is an excellent and inexpensive gift that she will enjoy. Manicures, pedicures, and styling or coloring hair are excellent “spa” type gift certificates to give that Grandma will really love! Grandpa will also enjoy certificates to get his hair cut, or a nice shave! It is more difficult to find gifts for male residents. Many like new hats – either baseball caps of their favorite team, hunting caps if they were once outdoorsy, or spiffy driving caps. Tennis shoes or nice looking, comfortable casual shoes are always a big hit. Unlike most women, men will usually be honest when you ask them what they would like or need. Women usually say they don’t need anything, but men will sometimes tell you they’d like a new sweat suit or pair of pajamas. If your recipient is mentally challenged or has advanced Alzheimer’s, concentrate on a gift that provides textural stimulation or comfort. A large, incredibly soft teddy bear or a brightly colored squishy pillow filled with polystyrene foam beads that you can’t stop squeezing make excellent gifts. They will enjoy these types of gifts, and the gifts will also increase interaction with other residents and caregivers who will make a fuss over the cute teddy bear or want to give the soft pillow a squeeze. Don’t just bring flowers on Christmas. To nursing home patients and assisted living residents, Christmas gifts mean a great deal. If you don’t have a lot to spend, it’s alright, because homemade gifts are special. Sentimental gifts are always touching, but silly and light-hearted gifts go a long way to brighten the day. Your gift should be something to make them feel special, loved, and remembered.